Microsoft Office 365 is an all-encompassing suite of collaboration tools that enables productivity more effectively than an assortment of tools. Microsoft Teams is a chat-based workspace that brings together people, conversations, content and tools—creating a more open, digital environment. Threaded conversations make it easy to understand what each employee is referencing, and employees can co-author and collaborate on Word, Excel, PowerPoint, and OneNote documents without ever leaving the app. The collaboration tools we purchase are meant to help us, but licensing costs, service fees, IT resources, and employee downtime can add up. 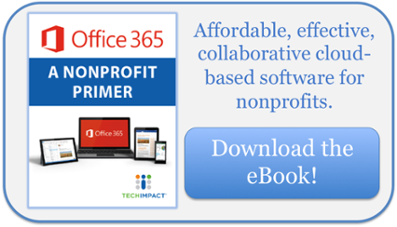 You might be trying to save your nonprofit time and money by adding more productivity tools without realizing the hidden costs. Instead of pulling from multiple vendors, installing a set of collaboration tools from a single suite can save a staggering amount of money. With the risk of data breaches continually on the rise, your security team is likely apprehensive about your company’s information security. Hackers are more prolific than ever, damaging organizations’ financial stability, reputation, and employee relations. Additionally, threats can originate from within, when an employee unknowingly puts an organization a risk by clicking on malicious links or sharing sensitive information externally using an unsecure app. Using a suite of collaboration tools isn’t just more simplistic, it’s also more secure. You’ll know where your organization’s data is stored, which employees have access to it, and what methods of security and compliance are protecting it. all of an organization’s incoming and outgoing email for sophisticated attacks, unsafe attachments, and malicious links. Implementing a new suite of tools can seem overwhelming. Office 365 lets you move at your own pace and allows your employees to get up and running faster. With a suite of tools available to implement, you decide whether to migrate employees over in groups or by program. The ability to implement a steady rollout allows you to save costs and increases productivity by helping your business adapt to new streamlined solutions over time. With hybrid (cloud and on-premises) server systems like Microsoft SharePoint, workers can store and share your organization’s files securely at any time, whether they are in the cloud or still on premises. Employees can identify the files they have access to, find relevant connections, then directly share and discuss with their teams. When transitioning to a new system, one question often remains: How can IT manage the transition and the platform’s upkeep with their existing resources? Not only will a transition take up valuable end-user time, but it can also be a massive undertaking for your IT team. Automatic updates will save IT some valuable time, and Office 365’s team of experts will help them at each step in the process.